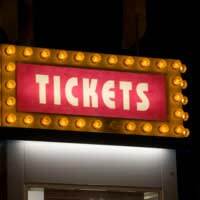 When you buy a ticket for a show, be it a concert, a play, or a West End musical, you expect to be admitted, and in most cases have a seat already assigned, and to be able to watch the performance you paid to see. That's essentially the contract you and the company putting on the show are making when you purchase your ticket. If you turn your ticket over, you'll find the "terms and conditions for issuance," often in very small print, making it hard to read. In most cases they're relatively standard, and they give you information, including the conditions for a refund. If you're booking by phone, whoever sells you the ticket should tell you the terms - its part of your rights. Generally, they're fine. What you need to watch out for, though, are unfair terms. What exactly is an unfair term? It's one that gives one party (in this case whoever's selling tickets) a heavy advantage over the other (you, as the ticket buyer). It can be a way to duck legal responsibilities or put too many obligations or restrictions on you to the point where you become powerless. They'll be down in the fine print. The goods news is that unfair terms aren't binding. The bad news is that you'll probably have to go to court to ultimately decide if a term is unfair. What should you watch out for? Basically, anything that leaves you without rights. Perhaps the biggest one would be a clause whereby the business could change a show in whatever way it wanted. But there are several others worth noting, like denying or limiting refunds even if a performance didn't happen, or denying liability even in the case of personal injury or death. Let's say you've made a special trip from Newcastle to London. You've not only booked tickets for a West End show, you've paid for rail tickets and a hotel. You get to the theatre, only to find the show's been cancelled. What can you do? You're not only entitled to a refund for your tickets, you might well be able to claim compensation for your other expenses - which are seen as losses. Whenever a show is postponed or cancelled, you should be able to claim a refund on your tickets. If you've booked to see a musical with a certain star, then the management can't blithely put someone else on in his place - substitutions or different casts simply aren't acceptable. In most circumstances, you can claim compensation in cases like this, and it might be equivalent to a full refund. How can you complain if you feel a performance hasn't lived up to its expectations? Note that doesn't mean the quality of the show - that's subjective. Go to the box office first. If that doesn't help, try the manager, who has more power. Failing that, write to whoever put on the show, but make sure you keep copies of all the correspondence. As a final resort, if you're unable to come up with any other resolution, take the company to small claims court. With unfair terms, you need to take a different tack. If you feel you've been a victim, contact the http://www.oft.gov.uk Office of Fair Trading who can investigate. I bought tickets for a concert through a private seller on Gumtree which was subsequently cancelled. I received the genuine tickets in advance of the concert date by recorded delivery. Following the cancellation I have contacted the seller who has refused to refund me the ticket price stating that they were not responsible for the cancellation. Is their position legally correct? I understand that refunds were issued by the concert promoters but the seller claims they did not receive this as they themselves had bought the tickets secondhand. I paid for the tickets through PayPal. Am I ntitled to any refund? Hi, We attended the Radiohead concert last week in Manchester, travelling from York. We arrived outside the stadium in good time, with 45-50 minutes until the band came on. The security (G4S) was however terribly organised, and with each ticket specifying which gate (Old Trafford Cricket Ground) we had to go through we joined the mammoth queue for gates 10-11. The queue was big and zig-zagged up and down the road, before turning left towards the Great Stone Road. There were literally hundreds of people and we had our 8 year old who was stressing that we might miss the band. 45 mintues later Radiohead start (8pm sharp because of a curfew) and we are stuck in the part of the queue that still has not turned the corner (this is before we find out there are still further zig-zag theme-park queues inside the grounds of the venue).We finally got in 1hr:25 mins later after we started queuing (around 8:30pm) having missed a quarter of the set. Everyone in that queue was seriously annnoyed and I have been badgering Radiohead's ticket line (Sandbag) for a while, to be told today I am not entitled to any refund. We feel this is seriously unfair, having left York as soon as we'd both finished work, and were treating our son to his first Radiohead gig (the remainder which was fantastic btw).I feel that Sandbag are avoiding the issue, and while I wasn't expecting full refund of the £220 I spent on three tickets, I would have thought they would have offered a good-will gesture, instead of this Don Arden approach to keeping all the cash from excessive ticket prices whatever the cost. I'm now looking to take this further, just on a point of principle, but was wondering if there is anything I can get a policy/legislative handle on. The ticket says in the Ts and Cs that "the ticket holder acknowledges all risks incidental to the event for which the ticket is issued, whether occuring before. during or after the event".Would you interpret that as covering the excessively long queues we experienced?? Thanks (a very annoyed Radiohead fan). On Wednesday June 28th 2017,, together with my partner, I attended the Adele concert at Wembley stadium. Our seats were in the corner of the stadium. The central stage was constructed with four, mirror-clad, supporting pillars, one at each corner. The pillar at the corner of the stage closest to us covered approximately 25% of the visible area of the centre of the stage which was the main performance area. This included the spot that Adele returned to (where I believe she had a table and a drink, but I am not really sure, we couldn't see) from which she delivered her patter between numbers.The pillar obstructed our view of the stage. As a result on more than half of the songs we could not see Adele for significant periods of the performance, sometimes for the whole of a song. The tickets we purchased were full price and were not marked as being "restricted view". Had they been so, we would not have bought those tickets at all.We believe we are entitled to a refund. Would that be correct? In general you should raise this issue at the venue either before the start or during an interval. You may be able to claim a partial refund if the tickets were not described as "restrictive view". Write to the ticket seller and/or venue. On Wednesday June 28th 2017,, together with my partner, I attended the Adele concert at Wembley stadium.Our seats were in the corner of the stadium.The central stage was constructed with four, mirror-clad, supporting pillars, one at each corner.The pillar at the corner of the stage closest to us covered approximately 25% of the visible area of the centre of the stage which was the main performance area.This included the spot that Adele returned to (where I believe she had a table and a drink, but I am not really sure, we couldn't see) from which she delivered her patter between numbers. The pillar obstructed our view of the stage.As a result on more than half of the songs we could not see Adele for significant periods of the performance, sometimes for the whole of a song.The tickets we purchased were full price and were not marked as being "restricted view".Had they been so, we would not have bought those tickets at all. We believe we are entitled to a refund.Would that be correct? My wife bought tickets for an event in November 2015 back in October 2014 as a Christmas gift to me. We have possession of the tickets but the selling company have now asked for them to be returned as they apparently weren’t authorised to sell them. They of course offered a full refund but that doesn’t cover the travel, accommodation etc. We both want to attend the event and sit where we planned. Do we have to return the tickets or are we entitled to attend with the tickets we possess? @Dan. We think it's fair that you are offered some recompense for this if it's clearly their mistake. Send a letter requesting 50% refund - back up with the evidence that you have from the venue itself too. I bought tickets for a show from a major online ticket agency. They sold me tickets using an old seating plan - the venue say they told all agencies to stop using the old plan following a new layout. In the new layout with our seat numbers my partner and I ended up sitting apart with an aisle dividing us, instead of sitting together as shown on the agency plan at time of purchase.This spoiled our evening. The ticket agency refuses to do anything, claiming they always used the correct plan – but that’s a fib as the wrong plan is still on their site!As the agency mis-sold the tickets and it’s their mistake, do they have to compensate me for selling us the wrong seats and spoiling our evening? Any advice gratefully received! Just attended the BIg Family Day Out in Halifax. PLEASE warn all families to avoid this show. It was advertised as having a performance of the award winning CBBC Horrible Histories series ...a sad man in a poorly fitting Henry V11 costume with no props, scenery or music and a knowledge of the period that would shame a six year old came nowhere close. As for the fantastic phizz whizzing story telling sessions by people from the Roald Dahl Museum - a lonely table in a wet field with worksheets on it did not live up to the description either. At 48 pounds for a family ticket it is adisgrace ...it has been touring the country - please spread the word to avoid like the plague! I've booked 3 theatre tickets which costs 135 pounds thru Encoretickets Co. online. Their system went very fast and before I realized I put the wrong date, they deducted money from my account already. I wrote back email and requested refund immediately. They replied they would refund the amount to my account. But now after more than a month, they still not yet refund my money. I kept on writing to customer service to file my complain but they seem to ignore me. What can I do now to get back my money? I have not use any of their tickets, I feel just miserable. Can anyone help?